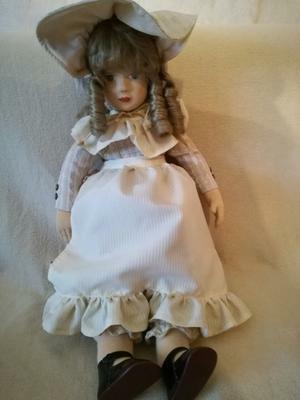 I recently got a large vintage doll, 50 cm / 20 in tall, supposedly German origin. I am in antiquities business, including toys, but dolls are not my specialty, that’s why I’m here to ask. The doll has body, sewn from body-pink textile, nice work (look at palms/fingers), but the head seems to be textile-covered-vinyl with painted face and most probably natural human hair. No maker’s mark to be found anywhere. Extremely good condition/dress, underwear, apron everything intact and clean but looking at the face and overall image, seems to be quite old one. 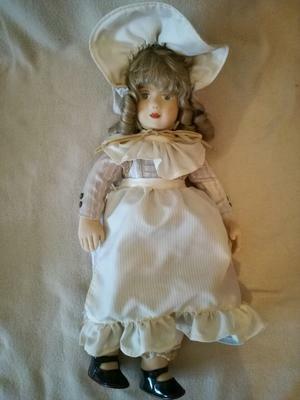 Please can anyone help me to identify which period this doll might be from and what’s it’s worth?